On Arrival at Srinagarairport meet with our representative & assist then transfer to check in the houseboat. Evening Free for Leisure .Overnight stay at Houseboat. 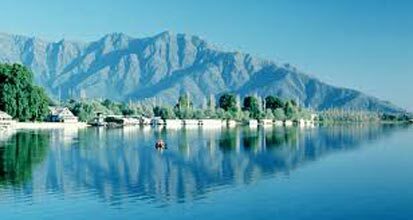 After breakfast proceed for half day tour of world famous Mughal Gardens visiting the Nishat Bagh (The garden of pleasure) and Shalimar Bagh (Adobe of love) , Shankaracharya Temple , Pari Mahal , Hazratbal Shrine .In the afternoon Shikara ride on The Dal Lake to enjoy the beauty that God has graced this city . You will get a view of some very interesting places around the Lake. Overnight stay at Deluxe Houseboat. After breakfast proceed to full day excursion of Sonmarg which is one of the most beautiful drives from Srinagar. Sonmarg also called Meadows of Gold is located at a height of 2692 meters. You may take a pony ride (at your own cost) to Thajiwas Glacier where snow remains round the year. Evening Back to Srinagar .Overnight Stay in the Houseboat/hotel. 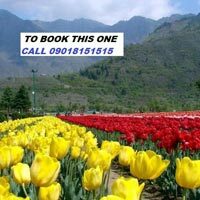 After breakfast and proceed to full day tour of Gulmarg which is one of the most beautiful summer resort in the Kashmir valley. at the distance of 60 kms which will be covered in app. 2 hours. Gulmarg has one of the best ski slopes in the world and highest golf course with 18 holes. Enjoy the splendor of nature and the snowy mountains. One can have Gondola ride (cable car) from Gulmarg to Khalinmarg. evening back to srinagar .Overnight stay in the Srinagar . After breakfast drive to Pahalgam (The valley of shepherds).Which is about 96 kms from Srinagar, which will be covered in app. 3 hours. You Can visiting the saffron fields of pampore, Awantipura Ruins (1100 years old temple of Lord Vishnu built by the King Awantivarman), o n En-route. Drive throught the pine forests. Arrive at Pahalgam and enjoy Lidder stream. Later walk along pony trails with a magnificent view of the mountains. Overnight Stay at Pahalgam. After breakfast day at leisure. You may go for walks or pony ride to one of the many beautiful spots around Pahalgam. Dinner and overnight at the hotel. Overnight Stay at Pahalgam. After breakfast proceed to katra , on the way take sightseeing of patnitop , nathatop , sanasar . On Arrival at katra , check in the hotel . Overnight stay at Katra Hotel. After breakfast proceed to Mata vaishno devi Cave Darshan ( trek of 14 km from the katra town ) , After Darshan Back to Katra . After breakfast proceed to jammu & drop at jammu railway station/airport for your onward flight.